I'm doing a happy dance at the moment because I have 250,000! No, that's not how much I won on Saturday Night Lotto or last week's Power Ball - That will never happen because I don't even buy those kind of tickets anymore - because I never win! This is a different happy dance and a different win - I'm doing my version of the Macarena right now because I just reached 250,000 views of my blog!! Yes, I know for many bloggers it would be just a blip on their radar that they reached years ago - or they reach this number every month, but for me it's a really exciting milestone. Sometimes I wonder how I even got here - two years ago I hadn't given blogging a second thought - or a first one either for that matter! I didn't know that blogging was a "thing" that people did (let alone the fact that there are MILLIONS of people doing it every day!) For me it was a spur of the moment thought that became an action and before I knew it I had leapt into the wild and weird world of blogging. When I started I had never heard of HTML, or SEO, or key words, or Google Analytics, or StumbleUpon, or Flipboard, or Link Parties, or Facebook groups, and even Pinterest was only something I had recently begun to get my head around - and certainly not rich pins or Pinterest Analytics! Then there was Blogger vs Wordpress vs Self Hosting vs Square Space vs Weeblie or goodness knows what else! Then there were sponsored posts, and guest posts, and links, and advertising, and writing for your reader and not for yourself, and minimum numbers of words per post, and what time you post, and social media promotion, and the list just kept growing like Topsy! Who'd have thought all this stuff existed??? I think why reaching a quarter of a million views really 'rings my bells', so to speak - (is that an Australian term? Along with 'floats my boat') is that I have done almost none of the recommendations and suggestions that I listed above. I tried a few and for the most part, I hated all the rah-rah promotion and the time consuming nature of trying to be everywhere at once. I struggle to be enthused by writing posts on washing detergent, or incontinence pads, or hand wipes, or whatever are being given out for free by sponsors, so I've never bothered responding to the emails that offer things I'm not interested in. I still work three days a week, so I don't have time to be at every link party, and on 30 facebook groups, or posting on Twitter, Instagram, Pinterest, Facebook, G+ etc sixteen times a day - and I refuse to use a scheduling tool (another thing I never knew existed two years ago) because it all becomes too business-like for me. I need time where my head is elsewhere - where I'm in the sunshine, or looking at pictures of my grandbaby, or talking to my husband, or phoning my daughter - not worrying about blogging stats. As far as "writing for my reader" goes, I'm afraid what I tend to do instead is write about things I love, about things that touch my heart, or make me smile, or lift my spirits. I write about how great this time of life is and how I've arrived at that conclusion. I write because I love to - and that isn't necessarily the way to get "readers" but by some weird and wild turn of events, I seem to have found other people who come to visit and read my stuff - not all of it I'm sure, but bits they like and can relate to - and that's one of the reasons why I blog. 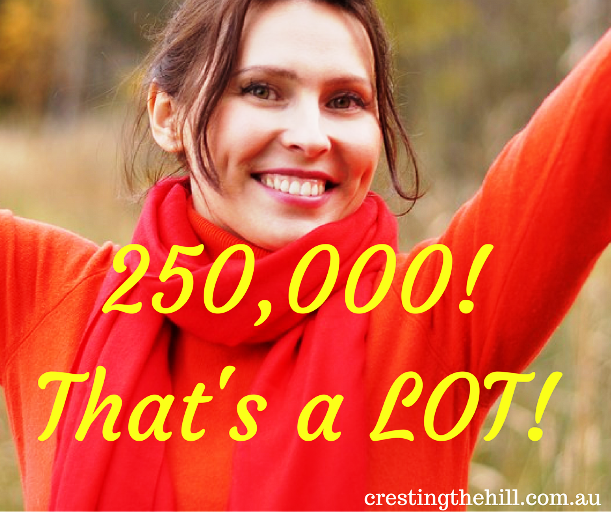 So, if you are reading this and you are one of the 250,000 views I've had - then I want to say THANK YOU!! I want to say how much I love that I seem to have organically found my "tribe" and my "niche" and I love the comments, and the interaction, and reading other blogs, and commenting on them, and the facebook connections, and the huge boost this has given to my well-being and my self esteem. Wow congratulations Leanne, that is a huge milestone. What a great way to end the year. Thanks so much - I felt very chuffed when I saw the views - I remember being excited when I had 100 views! Congratulations! This is super awesome! Thanks so much Bren - it is a bit like winning Lotto isn't it? Congratulations Leanne and you certainly deserve this great milestone! I'm so glad I met you through blogging and that our friendship continues. I love that you haven't followed the 'rules' and proven that if you write, they will come. Sending hugs and kisses. Hi Terri - thanks so much for being one of my "tribe" that I didn't know I'd acquired - I just got really lucky! I love the connections and reading blogs like yours and sharing the fun along the way. Happy Christmas! What lovely things you've said Donna - thank you so much and I love that we've connected - that's the biggest joy I've found in blogging - the lovely people out there who are all making the same discoveries and loving this blogging bug that we've all caught! 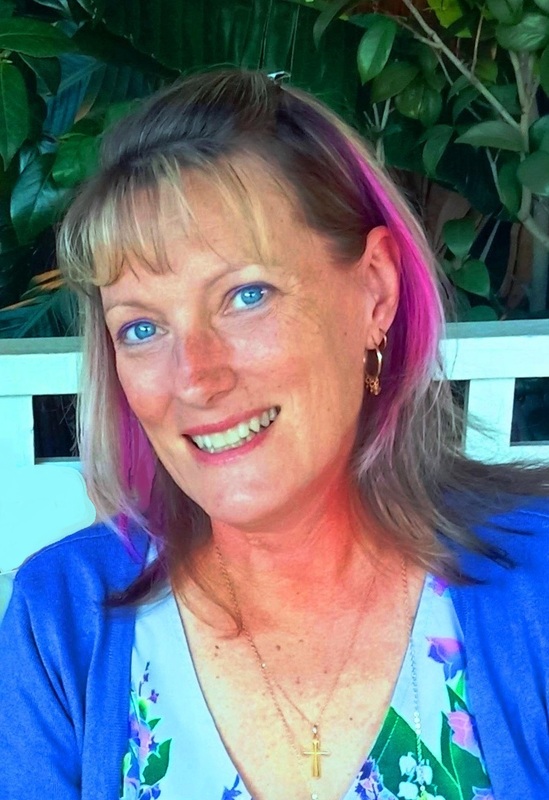 Hi Mary Lou - it's been great having you as part of my tribe and I'm glad that Canva has made you as happy as it's made me. To know you're not stealing other people's stuff is a really great feeling isn't it? Youve worked really hard. And it shows. Congratulations! 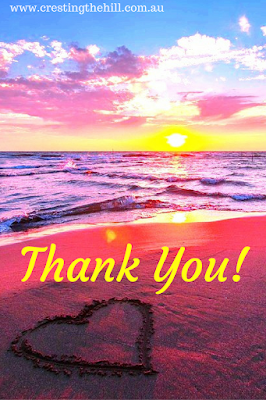 I am delighted to be part of your tribe and always look forward to reading your posts because they resonate with me. Wishing you continued success! Thanks for your friendship and all the shared post reading Haralee - it's lovely when you meet other people who have a similar world view and you can meet across oceans! Congratulations Leanne! What a terrific accomplishment. You're very welcome. Always nice to see you here, my friend. Always. 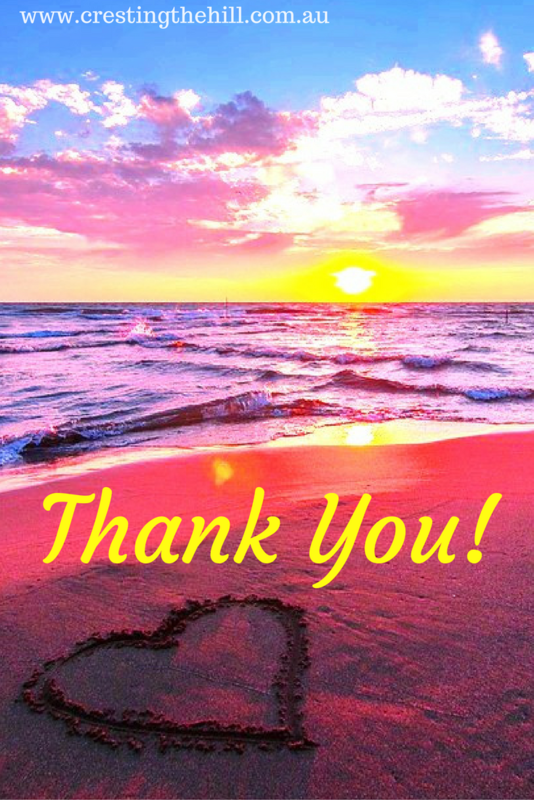 Thanks so much Carol - and for stimulating my brain with your interesting posts too! What can I say but WOW! In only two years! I think that must be some sort of record. And people come here because of your writing from your heart! Congratulations Leanne! I too never would have imagined how blogging would change so many things for me. I look forward to your posts in 2017. Congrats! Blogging can be very rewarding.